All wheels on this page have a round arbor hole for mounting on a tool arbor. 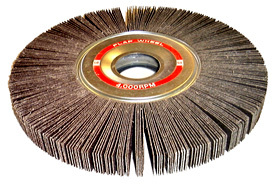 Most flap wheels can be bushed to different size arbor holes. Email us for other sizes, grits, or arbor holes.